Fine art resides not only in the cosmopolitan cities. It lived, as we saw in the recent movie “The Monument Men”, in the many villages of Europe. Right now, we are seeing it living on the periphery of Orlando, Florida. Home to Stetson University, DeLand is forty minutes north of the regional core of downtown Orlando. It is one of those delightful, off-the-beaten-path towns that tourists love to stumble upon and explore; the largely intact, century-old strip along Woodland Boulevard is vibrant, bohemian, and alive. Florida’s archipelago of cities compete for the hip and the cool, and it is easy to dismiss places like DeLand. Cities and towns in this state have, for the most part, yet to grow the kind of institutions that speak of maturity, sophistication, and worldliness. The draw of DeLand is not sidewalk urban hipsters sipping lattes; instead, it speaks of a new age of curiosity, individuality, and appreciation for experience outside of the roaring din of the city. The newly re-named Museum of Art – DeLand signifies a powerful future for this part of Central Florida. In the first half of 2014, Bolge’s exhibition run includes veteran Florida artist Jill Cannady, whose evolving career has stayed one step ahead of her critics. “This is important for people to see, and she is right here under our noses in DeLand, Florida,” said Bolge. Recent exhibitions like “Forging an Identity: Contemporary Latin American Art” drew patrons to exciting international artists who have helped shape Florida’s cultural and social ideas. In the official story of urban triumphalism, a museum executive should take his victory lap in Manhattan or Paris. Bolge, however, chose not to follow the herd. He was beckoned to DeLand by the opportunity to take an arts institution from good to great. The museum has its own building, a tan, prismatic form just north of downtown. Its exterior is a windowless enigma which belies a wonderful, light-filled volume within, one suited for showing world-class art. Its multifunction lower level has an atrium space and gallery, and an upper level gallery and classrooms. It's a flexible facility that does its job by putting the art first, staying in the background, and being accessible to all. 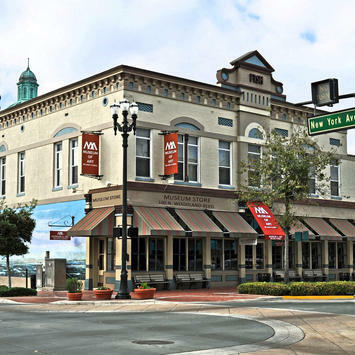 Even more interesting is the Museum of Art – DeLand’s downtown satellite, at the corner of Woodland and New York, six blocks south of the main gallery. This space, with a wood-floor and the rough-brick feel of a Chelsea loft gallery, recently exhibited “Small Masterworks” borrowed from the Butler Institute of American Art. Ascending the stairs, one is greeted by a free-flowing series of galleries which take you from a sunlit-filled reception area to a deep, introspective space that cleverly maximizes the art viewing experience. From Benjamin West, an American-born colonial artist, to Warhol, Lichtenstein, Motherwell, and others in the late 20th century, “Small Masterworks” provides sensitive and moving documentation of the evolving American art scene. DeLand, the quintessential American town, seems to be a perfect setting for it. This is the new story of Florida which is just now being written. While local art lovers are enriched by such an institution, it is drawing more and more attention from the surrounding metropolitan areas. With this museum, DeLand is now exporting culture to the city, in a reversal of the trend, signifying a maturation of the Florida arts scene. The Butler, in Ohio, is another example of this reversal. Nearly a century old with multiple locations today, The Butler is a solid institution with an international reputation. Something interesting is happening. As we have become used to mobility and flexibility, our world is no longer limited to where we live and work. With the internet, we are becoming increasingly connected. This favors DeLand, and places like it, with a new equity of distance – cutting-edge ideas are now a few clicks away. People in far-flung areas are less isolated. DeLand has a college vibe — a built-in art appreciation population — and with the rise of retiree enrollment, expect this population to go up. It’s affordable, walkable, and fun, with few of the big-city evils like crime and congestion that can scare away newcomers. No longer a tropical wilderness out of which man once carved a crude existence, Florida may now be settling down and becoming a more civil and aesthetic experience for its citizens. Towns like DeLand offer something that big cities like Orlando and Miami cannot: a high quality, human-scale lifestyle. Richard Reep is an architect with VOA Associates, Inc., and an artist who has been designing award-winning urban mixed-use and hospitality projects, domestically and internationally, for the last thirty years. He is Adjunct Professor for the Environmental and Growth Studies Department at Rollins College, teaching urban design and sustainable development, and is president of the Orlando Foundation for Architecture. He resides in Winter Park, Florida with his family.